They added this type of premium in January, 2011. 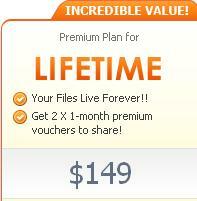 If you will buy this type of Premium you could use your Filesonic account without any limits. You can download from Filesonic all you like on the maximum speed. You can keep your files at Filesonic account during any time you need. And if you will buy this lifetime premium you will get as a bonus 2 1-month premium vouchers. You can sell this voucher and get some money back, or you can give it to your friends like a gift. Well, it’s really exciting news. But, for me, as a Filesonic affiliate, this Filesonic step has two sides: positive and negative. Negative is that people who has purchased lifetime premium from filesonic don’t need anymore to waste money on rebills or buying new premiums from this files host. So, I can’t earn on filehost Filesonc from such downloaders in future on their premium purchasing. It’s really bad. But positive moment is that each lifetime Filesonic premium costs $149, so from each purchasing of such Filesonic premium, which will be sold by me on my files, I will earn from $90 to $120. So, it’s cool! By the way, I already had 3 purchases of life-time premiums during last week. So, now you should think more than one time before switching to the Filesonic payment scheme $10 pay per sale. Because with such lifetime premium sales you can lose too much potential money. Good luck with lifetime sales! could you tell me where did you sell your premium accounts ? Write a comment to "Lifetime Filesonic"